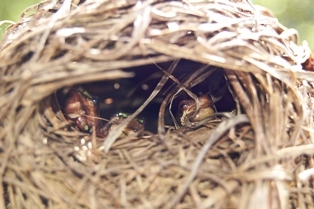 Oschadleus HD 2015 Weaver nests as a resting site for frogs. Herpetology Notes 8:129-131. Abstract. Reed frogs Hyperolius spp. and leaf-folding frogs Afrixalus spp. were recorded as resting in weaver bird nests in the daytime, from two sites in KwaZulu-Natal, South Africa. A Painted Reed Frog Hyperolius marmoratus taeniatus was found in a Southern Masked Weaver Ploceus velatus nest over a stream in 2004. Thirteen individuals of three frog species (Afrixalus spinifrons, Hyperolius marmoratus marmoratus, Afrixalus fornasinii) were found in the nests of a large mixed-species weaver colony in a wetland in 2009.